#80 "Inuyasha, Unhinged Player's Guide"
It's Mutant Mayhem, with the newest set for Marvel HeroClix! Hail to the new king: Upper Deck's Shaman King CCG! And don't get lost in Dragon Ball GT's newest set, Lost Episodes Saga! All this, and a five-color cover, too! 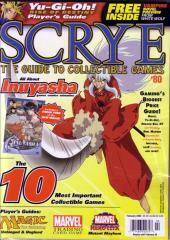 Scrye is your source for all collectible card games. Get the latest news, checklists, player strategies, deck-building tips and tricks and pricing all in this monthly magazine.